What is Polycystic Ovary/Ovarian Syndrome? PCOS is a serious genetic, hormonal, metabolic and reproductive disorder that affects up to 15% of women. 50% of women and girls with the condition are going undiagnosed. PCOS is a leading cause of female infertility and has devastating effects on women’s and girls’ self esteem, body image and social development due to symptoms including: excess facial hair growth, acne, hair loss, depression, anxiety and obesity. PCOS can also lead to type 2 diabetes, cardiovascular disease, endometrial cancer and other cancers. Common signs include infertility, irregular menstrual cycles (heavy, painful periods or absent or infrequent periods), excess body hair, thinning hair or hair loss, acne and other skin issues. Some women with PCOS have unexplained weight gain and difficulty losing weight while others have normal weight, or they can even be underweight. PCOS affects women differently. Not everyone has the same symptoms. Many researchers believe that insulin resistance, which can lead to central obesity, diabetes and heart disease, is a major culprit in PCOS and plays a part in many of the symptoms, including irregular menstruation and infertility. DON’T SUFFER IN SILENCE. If you have irregular periods and signs of androgen excess such as acne, thick facial and body hair and thinning or balding of the hair on your head. Ask your doctor (OBGYN, endocrinologist, family medicine physician, functional medicine, naturopathic doctor, etc.) to screen you for PCOS. Nutrition: Pay special attention to the type of carbohydrates you eat, try to eat more frequent, balanced meals to stabilize blood sugar. See a nutritionist to help you. Exercise: Get moving. Even walking helps! Also, try doing some resistance training once or twice per week. Stress Reduction and Sleep: Stress and lack of sleep creates further hormonal imbalance. Try yoga, seeing a counselor, or other things to reduce stress and get a good night’s sleep. Medication: There are some medications prescribe for sensitizing insulin antiandrogenic, and fertility drugs depending on your symptoms. Where can people go for support and more information? 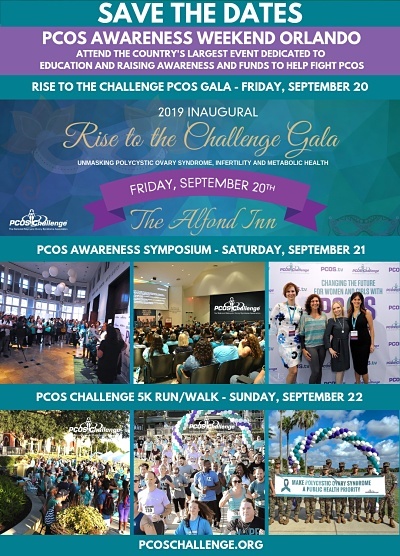 PCOS Challenge, Inc. is one of the largest 501(c)(3) nonprofit organizations advancing the cause for women and girls with polycystic ovary syndrome with over 24,000 members. PCOS Challenge offers PCOS education and support through television and radio programming, a magazine publication, online and offline PCOS support groups, and education and awareness initiatives. Since our beginning, we’ve helped many women find answers that helped them overcome their struggles with infertility, weight gain, anxiety and depression and reduce their risk for life-threatening related conditions.